Making sure a honeymoon destination is perfect right down the last detail requires having an eye for romantic possibilities. From the destination selected right down to the features the honeymoon suite provides, it’s the little touches that can make a couple’s first post-wedding excursion so very memorable. One of the “little touches” that can enhance the experience are honeymoon suites with a private plunge pool. Plunge pools are intended to be private escapes for a couple’s enjoyment only. Unlike resort pools that all guests can enjoy, these unique enhances are retreats meant just for two. 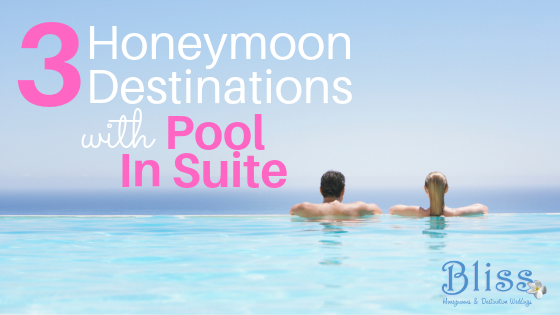 Plunge pools are found either inside the honeymoon suite or built within a private patio setting. Some of the world’s most notable resorts offer this distinct feature and take the experience to the next level by ensuring plunge pools are placed to maximize enjoyment of natural landscapes that create the perfect backdrop for romance. Here are just three of our favorite destinations with honeymoon suites that feature a private plunge pool. 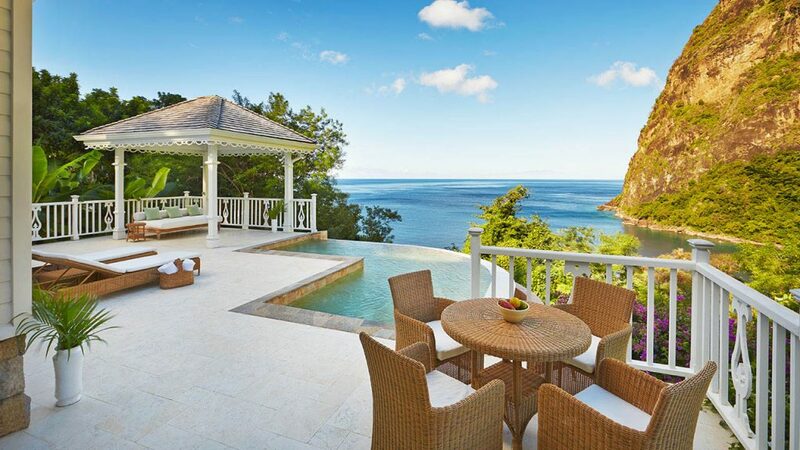 Located in St. Lucia, this Viceroy resort capitalizes on its romantic setting at every turn. Each of the resort’s rooms and suites are carefully situated to provide tremendous views of the famous Pitons or the beauty of the Caribbean Sea. Honeymoon suites and villas here feature an infinity edge plunge pool that is simply spectacular. The resort also features an array of onsite activities, a spa and its own restaurants and bars to ensure a lively nightlife for honeymooners who wish to explore beyond the splendor of their suites. This stunning resort set in a tropical rain forest deep within Costa Rica offers breathtaking views from every room. The adults-only resort is ideal for honeymooners not only due to the extreme privacy provided, but also the luxury appointments found in every room. Honeymoon suites that feature a plunge pool also offers tremendous views of the forest and the nearby mountains. Since the resort is located in the Arenal Volcano National Park, guests are guaranteed spectacular views. While exclusive romantic settings make this resort a favorite for honeymooners, Nayara Springs also boasts onsite dining, a space and a lineup of activities both on and offsite. 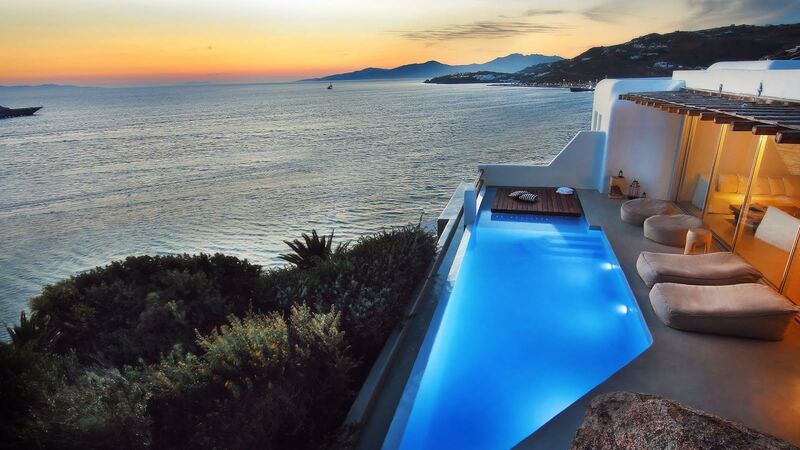 If the crystalline waters of the Aegean Sea beckon, this resort in Mykonos delivers breathtaking views. This seaside resort features honeymoon suites with a plunge pool with infinity designs that make it hard to tell where the pool stops and the Aegean begins. 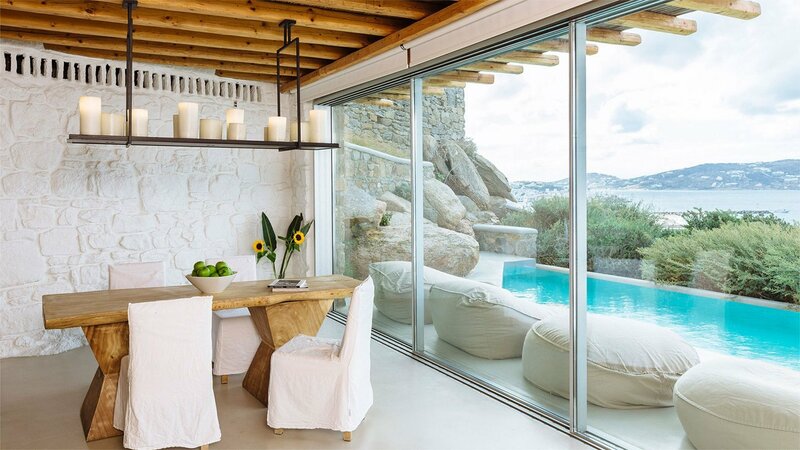 Built into a rocky hillside, this resort features onsite dining, a fitness center, spa and access to the many historic attractions that make Mykonos such an alluring destination for honeymooners. Romantic honeymoon suites with a private plunge pool is a beautiful option to consider. By capitalizing on their stunning natural settings, the plunge pools at Sugar Beach, Nayara Springs and Cavo Tagoo transform this distinct feature into something even more extraordinary. Call us today if you’re interested to chat more about any of these options!